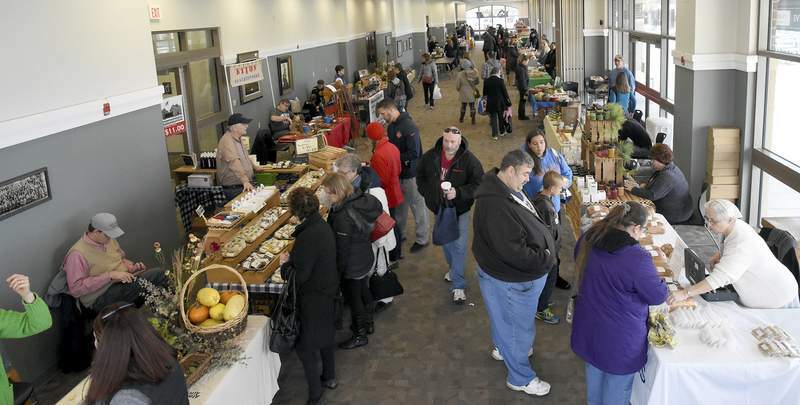 Photos by Rachel Von | The Journal Gazette Shoppers enjoy the variety of vendors and goods during the Fort Wayne’s Farmers Market at Parkview Field. The indoor market is open until May 13. 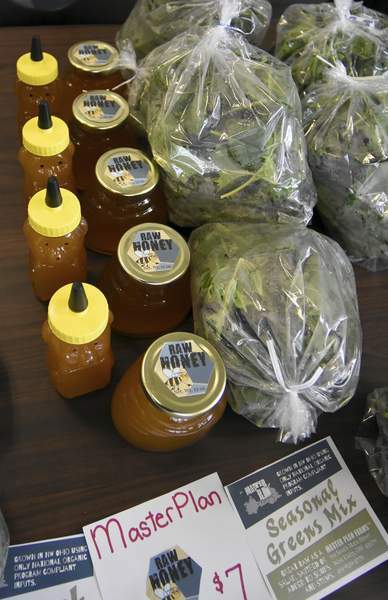 Master Plan Farms’ raw honey and seasonal greens mix is for sale during the Fort Wayne’s Farmers Market. 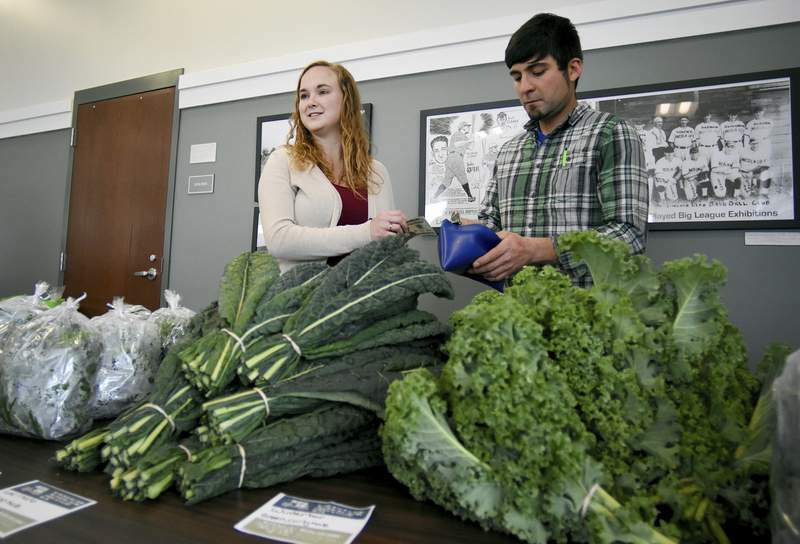 Master Plan Farms’ Allie Beck, left, and Matt Baker count change for a customer. In the winter, the market features a different variety of produce. 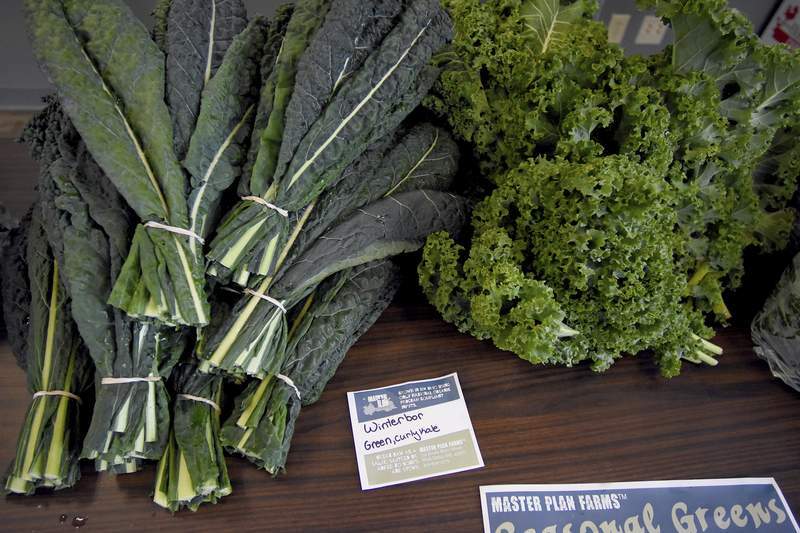 Master Plan Farms’ seasonal greens including Winterbor Green Curly Kale, right, and Lacinato Dino Kale. They replace typical summer fair such as watermelon and strawberries. Winter produce can be used to create comfort food creations to keep you warm. If you enjoy going to the farmers markets in the summer, there’s no reason to stop now that cold weather is here. Lisa Haagen, market coordinator, says that the only difference between the summer and winter markets is the produce. She said obviously in the summer shoppers can find watermelons, strawberries and tomatoes, but that doesn’t work well in the winter months because it’s cold. Most of the produce offered can be used in heavier meals the body craves this time of year. It’s comfort food, Haagen says. Haagen says shoppers can find different meats, such as a wide range of pork, chicken, turkey and beef, pasteurized eggs, leafy green lettuces and herbs, potatoes, onion, carrots, turnips, winter squashes such as acorn and butternut, collared greens and garlic. In addition, some vendors have provided hot peppers and blueberries that were frozen from the summer, as well as ginger root. Another vendor hopes to have tomatoes through February. The tomatoes are grown in a greenhouse and picked a day or two before the market. "There’s something about going downtown in the summer to the markets and picking up all your fresh produce, but once you get the hang of the indoor market … it’s still stuff you want – your body wants – and it’s delicious," Haagen says. And if you enjoy making soup in the winter, many vendors are providing bone broth, or you can buy the bones and make the broth yourself, Haagen says. Shoppers can also find breads, doughnuts and another vendor makes crepes on site. "There’s a unique mix of farm and food items," Haagen says.